April Fools Day Finds Congress Up To Usual Tricks : It's All Politics Some critics of Congress might say that every day is April Fools Day in Washington. House Republicans and Democrats seemed intent on proving that Friday during a debate over a GOP bill that a top Republican suggested, wrongly, could become law with only the House passing it. House Democrats did their best Friday to wear out the April Fools' Day theme in taking on a symbolic effort by their Republican colleagues to push through a constitutionally questionable spending bill. But, really, if you haven't been on the receiving end of any day-appropriate tomfoolery, the spectacle that played out in the House Friday afternoon should fill that void. Let's dispense with the obvious, oft-asked, question first: "Don't they have something better to do?" With that out of the way, here's what happened for those who weren't glued to C-SPAN or on Capitol Hill to witness the proceedings first hand. As Congress stumbles toward another budget deadline (a temporary measure keeps the government funded only through April 8th), an impasse between GOP-controlled House and the Senate and White House, both controlled by Democrats, threatens to force a government shutdown next week. While fast-and-furious budget deal making continued behind closed doors to reach a deal on a budget for the rest of the fiscal year that ends in September, House Republicans, led by a parade of freshmen on Friday re-introduced a spending bill with that was rejected by the Senate. The GOP bill contains about $61 billion in spending cuts, far more than Democrats say is acceptable. For branding purposes, the Republicans called the repackaged bill the "Government Shutdown Prevention Act." It includes a new provision to withhold pay for legislators and the president in the event of a shutdown. Language in the new version, however, gave Democrats a field day. The legislation says that if Congress fails to reach a budget agreement by Wednesday, the House measure is "hereby enacted into law." The "law of the land," even without Senate approval or President Obama's signature. Or at least that's how House Republican Majority Leader Eric Cantor characterized it Wednesday. Cue bombastic House floor messaging war that likely won't help Congress' already in-the-toilet approval ratings. Recent polls show that close to 70 percent of Americans say they disapprove of the job Congress is doing. There was a parade of freshmen Republicans, from Indiana's Todd Rokita to Mississippi's Alan Nunnelee, excoriating majority Democrats in the Senate for having the chutzpah to disagree with cuts proposed by majority House Republicans. They were interspersed with a lineup of Democrats, who relished the April Fools' opportunity to declare Republicans more ignorant than schoolchildren about Constitutional requirements for getting bills passed. "Don't pay any attention to this," said House Democratic Minority Leader Nancy Pelosi, directing her comments to a group of visiting parliamentarians watching Friday's deliberations. Republicans are asking for "a silly vote," on April Fools' Day, she said. 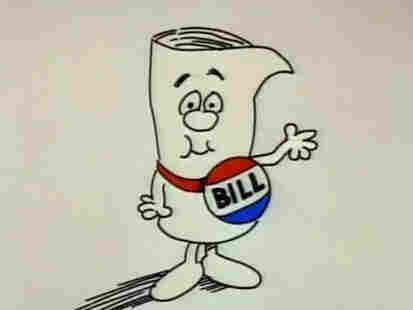 (Democrats pointed Republicans to the Schoolhouse Rock educational film from the 1975 "I'm Just a Bill." There are very real differences between how much and what both parties want to cut from the national budget to address debt and deficit. Those issues were not on display Friday. The patience of Americans is growing thin, said freshman Republican Rep. Steve Womack of Arkansas. The patience of working families is being taxed, said veteran Democratic Rep. Rosa DeLauro of Connecticut. Something to agree on, no April Fools.